With the lack of milk protein in dairy alternatives and a significantly lower level of dry matter, any stabiliser system must be adapted to this new challenge. Of course, mouthfeel often needs attention to better replicate the drinking sensation of milk. Katech has been working on improving the mouthfeel and stability of vegan drinks. 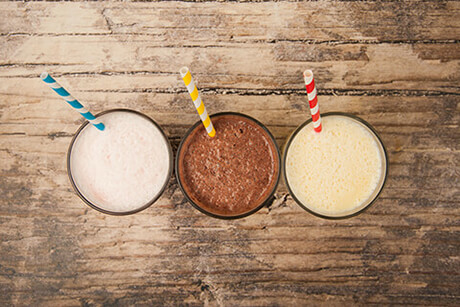 We have developed drinks using different milk alternatives based on soy, nuts or cereals like oat. If you are interested to find out more, please get in contact with us. In addition to developing robust and satisfying products, our developments for vegan drinks have been focusing on improving the mouthfeel and stability of the product using different milk alternatives. All developments can be produced UHT using the standard dairy technology. We can offer development recipes for neutral products with currently either plain, chocolate or vanilla flavour. Due to typical production processes, vegan drinks tend to separate easily over time. For a stable product, it is therefore essential to find the right stabiliser system that will keep particles in suspension. The right stabiliser system will also address issues that occur during production. At Katech we can provide a stabiliser system that perfectly fits your product and production process. Talk to us today to find the best solution for you. At Katech we have a lot of experience in cost optimising recipes. Looking at the recipes we can give ideas about rebalancing ingredients or exchanging ingredients to more cost effective equivalents or optimising production processes to reduce waste. Please talk to us today to find out more.